Kaspersky Lab is adapting to the needs of an ultra-connected world. A world in which people and organizations require greater transparency and trust. Starting from 2018, we are redesigning our infrastructure and moving the location for where we store and process some of our data, and build new software: the stuff that keeps our customers the world over safe from existing, new and emerging threats. 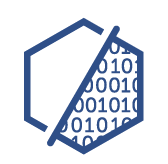 Within the framework of our Global Transparency Initiative we are relocating to Switzerland the data storage and processing for a number of regions as well as our software assembly infrastructure. We have also opened our first Transparency Center in the country. Information received from users of Kaspersky Lab products in Europe, to be followed by other countries including the U.S., Canada, Australia, Japan, South Korea and Singapore, will be processed and stored on Swiss servers. 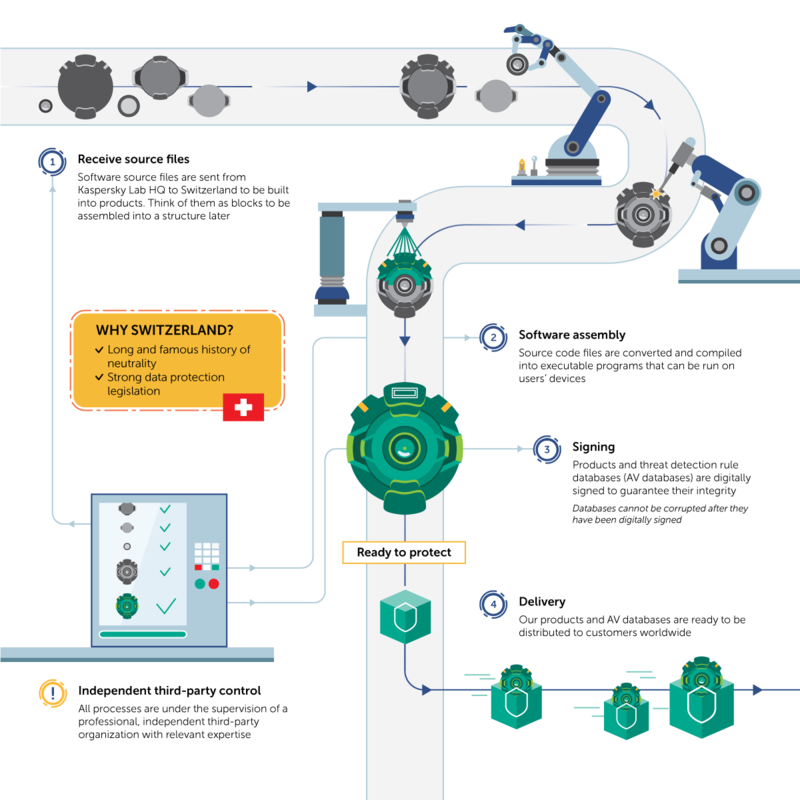 Relocation of assembly line of Kaspersky Lab products and threat detection rule databases (AV databases) to Switzerland, where they will also be signed with a digital signature before delivery to the endpoints. A facility for trusted partners and government stakeholders to review the company's code, software updates and threat detection rules. The company is also opening a Transparency Center in Madrid for its first visitors in June 2019. By 2020, Transparency Centers will be opened in Asia and North America. A new, non-profit organization qualified to conduct technical software reviews. The organization is currently working to onboard several partners. Transparency Centers serve as facilities for trusted partners to access reviews of the company’s code, software updates and threat detection rules, along with other activities. Through them, we provide governments and partners with information on our products and their security, including essential and important technical documentation, for external evaluation in a secure environment. Kaspersky Lab’s first Transparency Center was open in November 2018 in Zurich, Switzerland. In June 2019 another Transparency Center will be open in Madrid that will also serve as a briefing center where trusted stakeholders can learn more about the company’s portfolio, engineering and data processing practices. No other cybersecurity provider has done anything as far reaching as this. In opening its Transparency Centers, Kaspersky Lab makes a significant step towards becoming completely transparent about its protection technologies, infrastructure and data processing practices. To request access to the Transparency Center, please contact TransparencyCenter@kaspersky.com or visit the website. The security and protection of our customers is our top priority; therefore, we follow the strictest access-policy practices and reserve the right to turn down a request if it could potentially cause a security breach. ⚬ Prospective and existing enterprise partners and customers of Kaspersky Lab anywhere in the world. Under no circumstances whatsoever will Kaspersky Lab provide intelligence or law enforcement agencies that have a mandate and/or capability for cyber-offensive operations with access to the Transparency Center. The security information and infrastructure in the Transparency Center are provided by Kaspersky Lab strictly for consultation purposes only. Any actions to modify the company’s source code, software updates, or threat detection rules are forbidden and will be prevented by the TC Steering team; any abuse will be reported to the local law enforcement agency. The next level of Data Protection! While Kaspersky Lab’s current data protection practices are implemented in accordance with the highest industry standards and provide an extremely high level of security for any information processed by the company’s products and services, the company continuously improves its procedures for the protection of its customers’ data. From November 13, malicious and suspicious files voluntarily shared by users of Kaspersky Lab products in Europe have started to be processed in two datacenters in Zurich. These provide world-class facilities in compliance with industry standards to ensure the highest levels of security. The integrity and security of data processing and storage from users of Kaspersky Security Network’s (KSN) will be regularly checked and confirmed by an independent, third-party, Swiss-based organization. Moreover, every interaction between the data centers and Kaspersky Lab’s security researchers around the world will be logged, and assessed if needed by the organization. To keep you up-to-date with news on the relocation to Switzerland and the other activities that form part of our Global Transparency Initiative, we’ll be posting regular updates and progress reports in this section. ⚬ Kaspersky Lab opens Transparency Center in Madrid. In addition to a similar center in Zurich, opened in 2018, it will serve as a trusted facility for the company’s partners and government stakeholders. They will be able to come and check the company’s product source code and learn about Kaspersky Lab’s engineering and data processing practices, as well as the company’s portfolio. The center will be open to visitors from June. Previously announced plans for Transparency Centers to be open in Asia and North America by 2020 are still ongoing. ⚬ Transparency Center review system developed. This offers multiple review options according to the area of interest – from a general non-technical overview of the company’s engineering practices and data protection standards, through to the deepest and most comprehensive review of the critical parts of the company’s source code. More information about the available options can be found on the Transparency Centers website. ⚬ Kaspersky Lab publishes results of a voluntary third-party legal assessment, aimed at providing independent evaluation of the company’s obligations to Russian legislation. The analysis was conducted by prominent legal expert, Dr. Kaj Hober – Professor of International Investment and Trade Law at Uppsala University in Sweden and expert on the Russian legal system – and covers three Russian laws related to data processing and storage. These were widely reported as the ones Kaspersky Lab was obliged to comply with, being a Russian-based company. Results of the analysis are freely available online. ⚬ Bug Bounty program was improved by extending the scope of products for review. Security researchers can now investigate Kaspersky Password Manager and Kaspersky Endpoint Security for Linux, among others. Within a year of the extension being announced, we resolved more than 50 bugs reported by security researchers through the program, with bounty rewards totaling more than $17,000. On November 13, 2018, malicious and suspicious files shared voluntarily with Kaspersky Lab by users of the company’s products in Europe started to be processed in two data centers in Zurich. The data, which includes suspicious or previously unknown malicious files and corresponding meta-data that the company’s products send to Kaspersky Security Network (KSN) for automated malware analysis, is being processed in data centers that provide world-class facilities in compliance with industry standards to ensure the highest levels of security. The move reflects Kaspersky Lab’s determination to assure the integrity and trustworthiness of its products. It is accompanied by the opening of the company’s first Transparency Center, also in Zurich. Through the Transparency Center, Kaspersky Lab will provide governments and partners with information on its products and their security, including essential and important technical documentation, for external evaluation in a secure environment. Other activities in progress include the engagement of a Big Four professional services firm to audit the company's engineering practices around the creation and distribution of threat detection rule databases, with the aim of independently confirming their accordance with the highest industry security practices. Alongside this, Kaspersky Lab continues to support an active bug bounty program. Within one year, it has resolved more than 50 bugs reported by security researchers, of which several were especially valuable. ⚬ Kaspersky Lab’s first Transparency Center, also located in Zurich, will achieve initial operating capability by the end of 2018. The center will eventually provide responsible stakeholders with full visibility of the source code of our products and software updates. ⚬ The other pillars of our new plans, such as the relocation of software code assembly, including products, product updates and threat detection rule databases (AV databases), and the appointment of an independent, third-party to manage and review everything, will take place during the second phase of the project, after 2018. What is Kaspersky Lab’s Global Transparency Initiative? Kaspersky Lab’s Global Transparency Initiative (GTI) is a reaffirmation of the company’s commitment to earning and maintaining the trust of its most important stakeholders: its customers. It includes a number of actionable and concrete measures to involve external independent cyber security experts and others in validating and verifying the trustworthiness of the company’s products, its internal processes and business operations, and to introduce additional accountability mechanisms by which the company can further demonstrate that it addresses any security issues promptly and thoroughly. In the context of GTI, the storage and processing of user data from some regions, shared voluntarily with the Kaspersky Security Network, together with our software development infrastructure will all be relocated from Russia to Switzerland. In November 2018 we opened our first Transparency Center, in Switzerland, which serves as a facility for trusted partners and government stakeholders to review the company’s code, software updates, and threat detection rules. The company is also opening a Transparency Center in Madrid and will welcome its first visitors in June 2019. In addition to being a code review facility, the new center will function as a briefing center to learn more about Kaspersky Lab’s engineering and data processing practices. Why did you decide to relocate infrastructure? The relocation reflects our willingness to address customer concerns by, firstly, moving some of our data storage and processing to a neutral region while maintaining our high global standards of data security and integrity. And secondly, by assembling software and database updates so that an independent third party can easily ensure the source code from which final products and threat detection rule updates are assembled is the same as that available for security assessment in the Transparency Center. This move further demonstrates our enduring commitment to assuring the integrity and trustworthiness of Kaspersky Lab solutions in the service of our customers, and to addressing any concerns outlined by regulators. Why is data from some countries not moved to Switzerland, but will be processed in Russia? Based on what principle did you divide the countries for the relocation of data processing? The current list is an initial one. The list of countries for which data will be processed and stored in Switzerland will be further extended. How will the relocation affect the data of other users? There will be no difference between Switzerland and Russia in terms of data processing. In both regions we will adhere to our fundamental principle of respecting and protecting people’s privacy, and we will use a uniform approach to processing users’ data, with strict policies applied. What is a new independent, third party organization that will be reviewing your processes in Switzerland? Since transparency and trust are becoming universal requirements across the cybersecurity industry, Kaspersky Lab is supporting the creation of a new, non-profit organization to take on this responsibility, not just for the company, but for other partners and members who wish to join. The details of the new organization are currently being discussed and will be shared as soon as they are available. What will be available for independent review and assessment in the Transparency Center? Trusted partners will have access to the company’s code, software updates and threat detection rules, among other things. We provide three options to government stakeholders and enterprise customers for independent assessment of Kaspersky Lab products. Learn more here. Who is be able to review? Transparency Centers in Zurich and Madrid are open for inspections by trusted partners and government stakeholders. Please refer to our Access policy for more information. What are further steps to be taken in the framework of Global Transparency Initiative? We will continue to expand our Transparency policy to further demonstrate that we address any security issues promptly and thoroughly. By 2020, two additional Transparency Centers will be opened, in Asia and North America. More information about our transparency principles is available here.